I took advantage of the glorious spring weather recently to visit Tillamook (Birding Oregon p. 125). Nala and I completed the Tillamook Death March, walking all the way around Bayocean Spit. 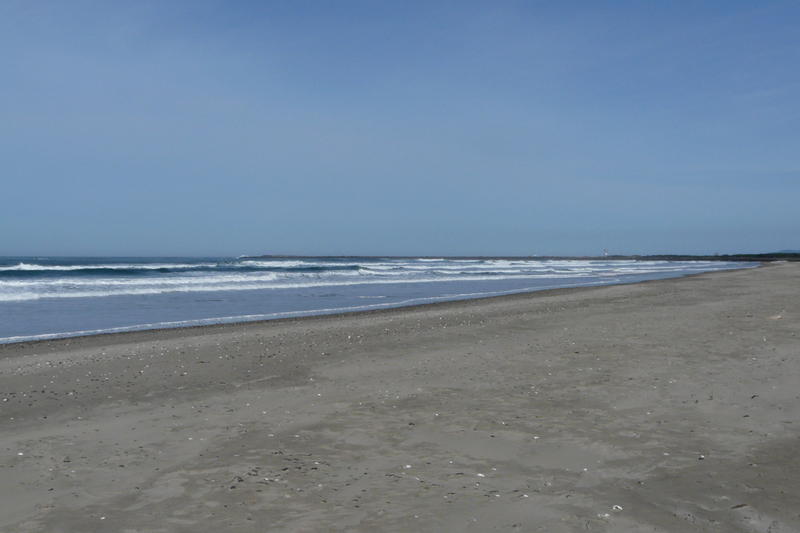 This is the only spot I have visited on the Oregon coast where you can walk for several miles along the beach and not see another person. You can barely discern the south jetty on the horizon. As expected, there weren’t a lot of birds on the ocean side of Bayocean. It is still too early for spring migrants and too late for winter specialties. 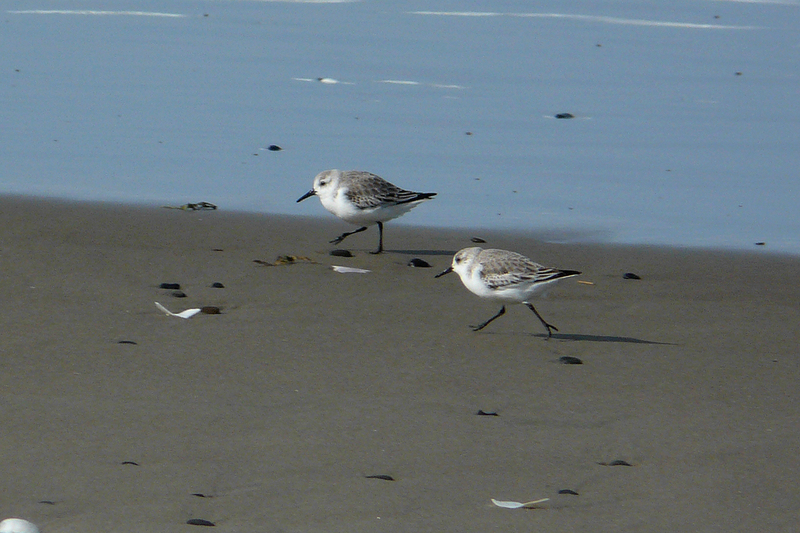 Aside from one Black-bellied Plover, the only shorebirds were Sanderlings, shown here doing their typical running along the water’s edge. There wasn’t much going on, birdwise, on the bay side of the spit either. The tide was high and there were a lot of boats on the water. 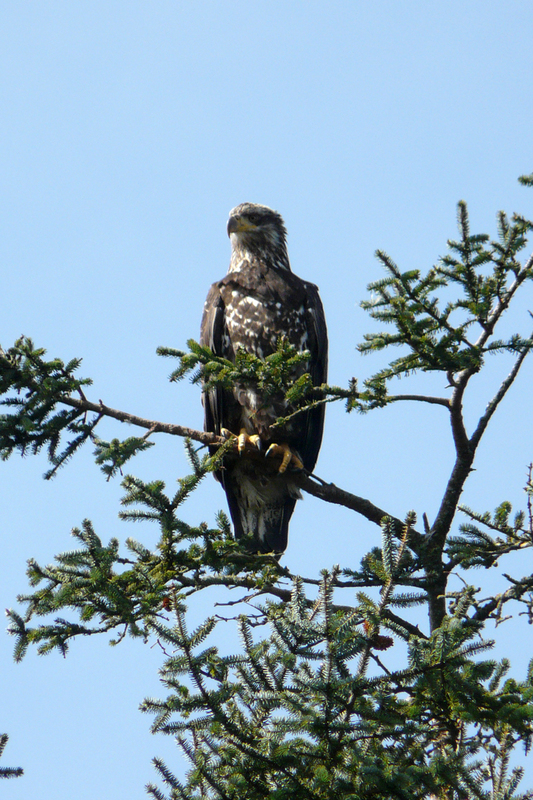 This was one of several Bald Eagles seen on our walk. 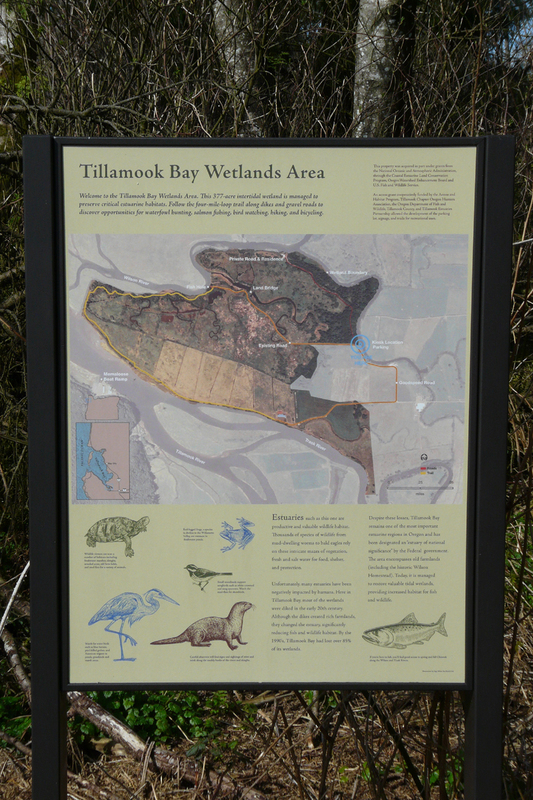 The main reason for my trip that day was to explore the Tillamook Bay Wetlands Area. 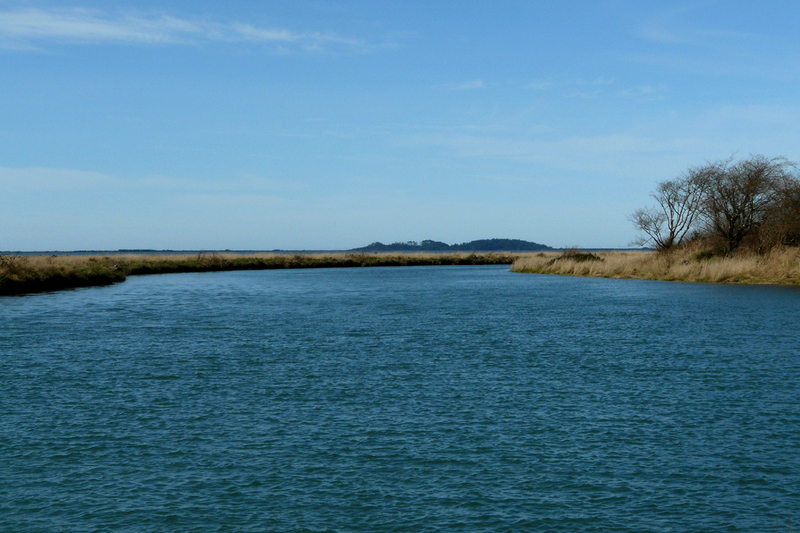 While this isn’t the most scenic of sites, it provides wonderful access to wetland and meadow habitats along Tillamook Bay. From US 101 on the north edge of the city of Tillamook, turn west onto Goodspeed Road. Follow this very rough paved/gravel road for one mile, bear right, then left, then right again to end at a small parking area with this sign. 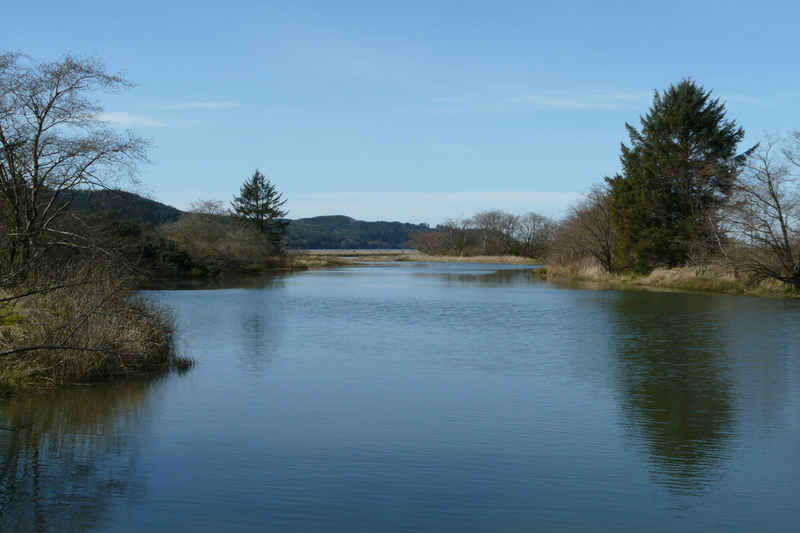 Wilson River, near where it empties into Tillamook Bay. The patch of trees in the distance is the wooded area of Bayocean Spit across the bay. 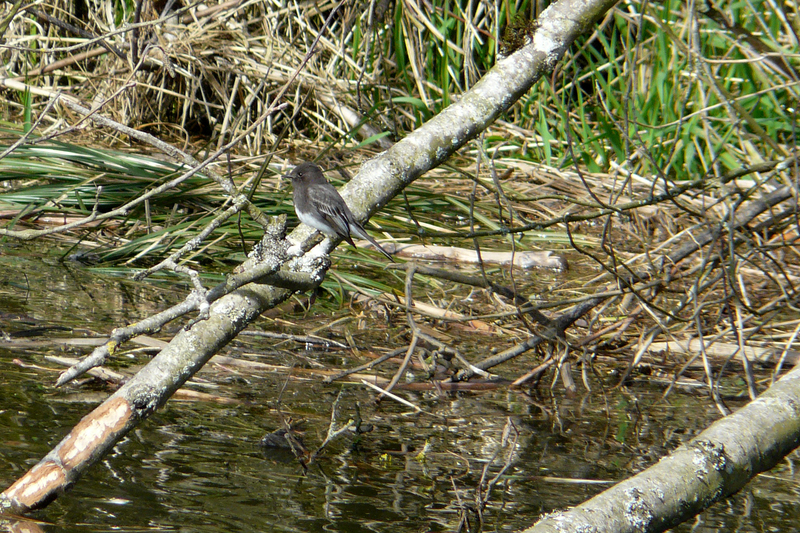 Black Phoebes were actively hunting from perches along the water’s edge. 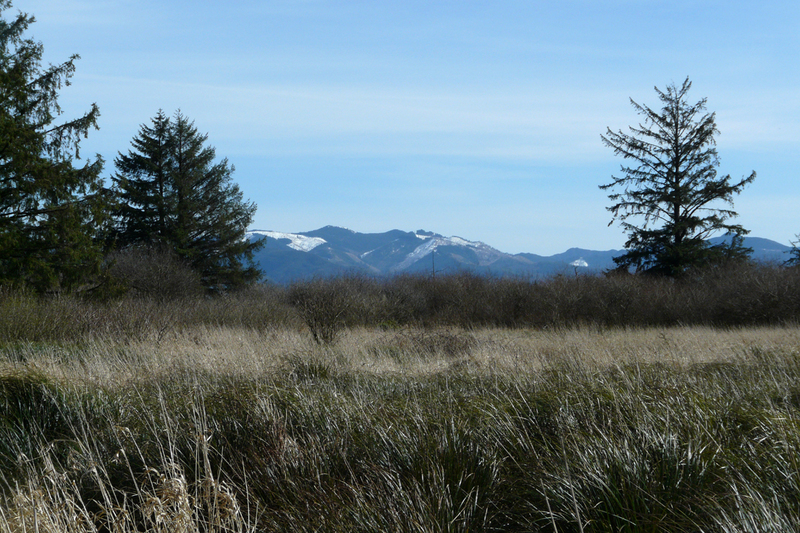 Marshy habitat with the Coast Range in the distance. Snow is visible on the clear-cuts. This entry was posted in OR Birding Sites and tagged Bald Eagle, Bayocean Spit, Black Phoebe, Sanderling, Tillamook Bay, Tillamook Bay Wetlands Area. Bookmark the permalink. Very nice photographs. What an interesting and beautiful location…thanks.